Solitaire Central is a niche web site that concentrates on solitaire games of all types. I noticed this review they recently posted. Please visit their site to see all the interesting solitaire games they have. 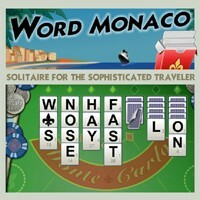 However, my game, Word Monaco, is a must see. 🙂 Here is their review. Word Monaco is a unique blend of a word game and a card game, where the playing cards contain letters rather than numbers and royalty, and your goal is to spell words rather than to build according to suit or value. At the beginning of each round, the cards are layed out as in Klondike solitaire. You must use as many cards as possible to spell as many words as possible within the tableau (there are no foundations). Each letter card is worth a certain number of points, based on how often it is used in common words (this is similar to the way that Scrabble and many other word games work). Words are spelled within individual tableau piles, and letters or words may be moved between piles to build new words, or to add on to or modify existing words. You can score bonus points by building long words, using all the letters, or using various power-ups that you earn during play. It’s an interesting concept, and it works reasonably well. There’s no time limit, so the game is really more of a puzzle than an arcade game (which is not a bad thing). As in most word games, success does depend a good deal on your ability to spell, and to recognize combinations of letters that form the building blocks for words. With a word list of over 50,000+ words, the game does recognize a great many possible words. The game uses only the one layout, as far as I can tell. With so many layouts available in solitaire, I don’t know why the developers limited themselves to just one. But that’s a minor complaint. The bottom line is this is a fun game. It’s certainly not your everyday solitaire game, but if you enjoy word games, I think you’ll find this to be a fun way to spend your time and exercise your mind.